The NOPRINT option suppresses the display of summary statistics, and the ODSTITLE= option uses the title that is specified in the SAS TITLE statement as the graph title. The INSET statement inserts the total number of analyzed home loans in the upper right (northeast) corner of the plot. 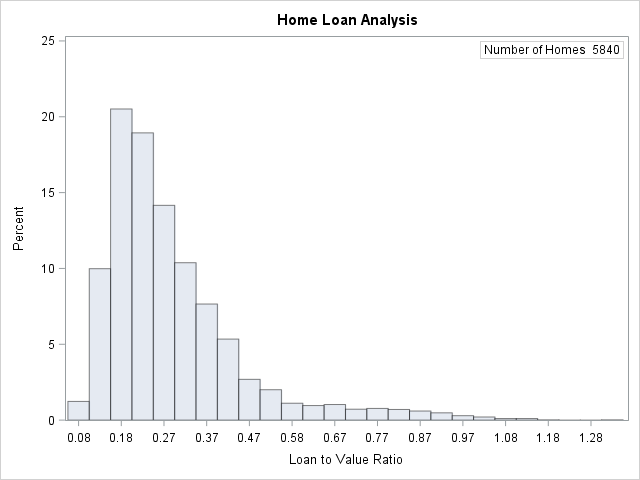 The data set HomeLoans contains a variable named LoanType that classifies the loans into two types: Gold and Platinum. It is useful to compare the distributions of LoanToValueRatio for the two types. The following statements request quantiles for each distribution and a comparative histogram, which are shown in Figure 4.3 and Figure 4.4. The ODS SELECT statement restricts the default output to the tables of quantiles and the graph produced by the HISTOGRAM statement. The CLASS statement specifies LoanType as a classification variable for the quantile computations and comparative histogram. The KERNEL option adds a smooth nonparametric estimate of the ratio density to each histogram. The INSET statement specifies summary statistics to be displayed directly in the graph. 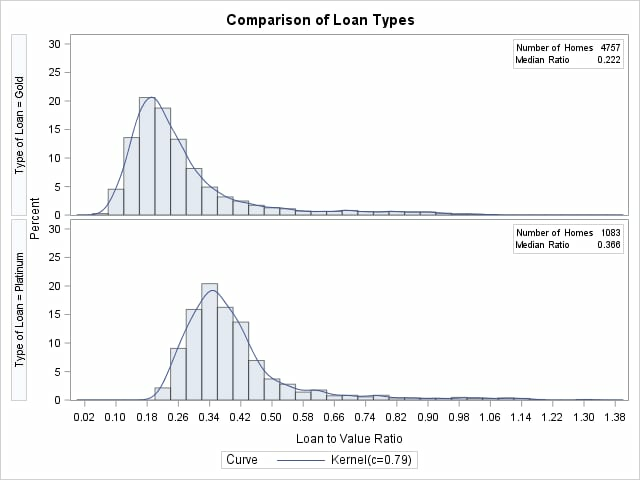 The output in Figure 4.3 shows that the median ratio for Platinum loans (0.366) is greater than the median ratio for Gold loans (0.222). The comparative histogram in Figure 4.4 enables you to compare the two distributions more easily. It shows that the ratio distributions are similar except for a shift of about 0.14. A sample program for this example, univar1.sas, is available in the SAS Sample Library for Base SAS software.